UPDATE: See the report from a local student who was in the March. Students turning frustration into action and the article about the Shoreline marches and the Republican response. Two Shoreline events. Shoreline and Lake Forest Park residents will join in Saturday's March For Our Lives in Seattle, March 24, 2018, which is expected to draw "tens of thousands" of participants. The March is in conjunction with the Washington D.C. march organized by surviving students from Stoneman Douglas High School in Florida where 17 students died in an attack from a mentally ill former student wielding a military grade assault weapon. A small group of local students will march in Shoreline, meeting on the Interurban Trail behind Walgreens at N 175th at 11am for an hour long rally. The Seattle event starts with a 10am rally at Cal Anderson Park. 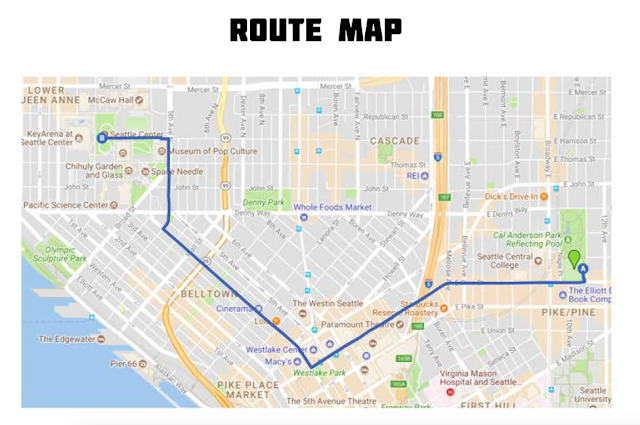 The march begins at 11am through downtown Seattle and ends at Seattle Center. Sound Transit plans to operate extra Link light rail trains to help serve expected crowds at Capitol Hill Station adjacent to Cal Anderson Park. Those planning to ride Link to the march can board trains at Edmonds. Customers also can ride Metro and Sound Transit to downtown and join the march from there. Metro will operate free return shuttle buses from Seattle Center to downtown Seattle.